Benchmark started as a small group of people with an idea, and not much more. Today they are operating an international email management company, and their goal is to help you grow in the same way that they did. Benchmark focuses on the seamless use of technology to help you connect to your client base on as many levels as possible. Their customer support is available 24/7, so you will never be left to navigate the waters of email management alone. 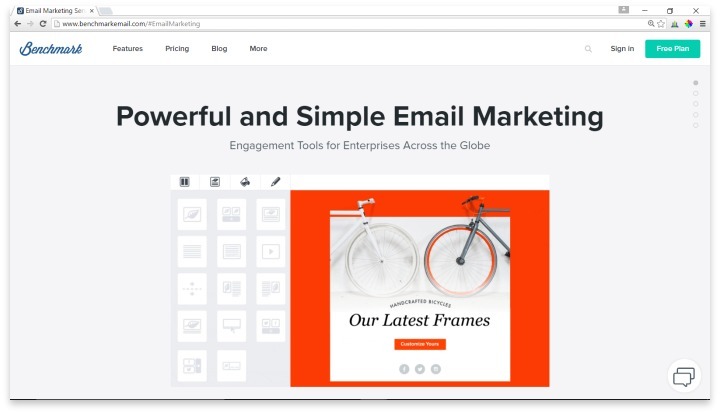 If you need to send a beautifully designed newsletter, full of perfect images, videos, sound clips, and interactive links, Benchmark is the service for you. Their email templates support every kind of customization that you need, including the ability to brand every email with your logo and business colors. The email design workspace is separated by tabs that walk you through every process, from adding a mailing list, to physically writing the email. With a drag-and-drop option and a plain-text editor, you’ve got ways to make the interface work for your abilities. The opens and clicks tracking happens in real time through the Benchmark website. You’ll be able to see forwards, link clicks, and every other kind of activity that will help you tailor your approach for every campaign. Additionally, their legendary customer support comes in multiple options. You can call, email, or speak with an agent through the convenient live chat box, which is great for getting quick answers to any trouble you run into. One of the nicest things about Benchmark is their free plan. Unlike some email management services, you can operate a totally free email campaign so long as you have under 2,000 contacts and 14,000 emails per month. After that, the prices are comparable to many other companies, although Benchmark does not offer the typical discount for paying annually. Instead, you pay based on either your send rate or the number of your contacts. While the pricing is mostly set up for small businesses and individuals, larger companies can contact Benchmark for pricing their higher volume email management. One of the major areas that Benchmark lacks is the ability to integrate with social media. You can auto-post a basic message to Twitter or Facebook when your email sends, but there is no way to lead your customers to social media from within your email, such as with services like iContact. Benchmark does allow integration with many popular marketing data services for your benefit, however. Accounts with services such as Shopify or Salesforce are easy to connect to your Benchmark account to help you build your contact list. Benchmark focuses on the seamless use of technology to help you connect to your client base on as many levels as possible with 24/7 customer support. Overall, Benchmark is a leading service in the email management industry. Their huge catalogue of templates that support all the media you need provide you with exactly the look and feel that you want to represent your business. Recently they’ve begun adding features such as polls and surveys, and have addressed the social media integration concerns that so many of their clients have brought up. As they work to improve their social media services, there will be very little reason to not choose Benchmark when you need the right email management for your small to medium sized business. Have you had an experience with this company? Please share your Benchmark reviews below.